Why Should You Choose Professional Over Individual Oven Cleaning? The most recent research shows that the oven, hob and extractor cleaning is the most hated household job in the whole of UK! Simply no one likes doing it! If you live in Battersea you are in luck! Prolux Oven Cleaning Battersea is here for you! Our mobile cleaning teams of professionals are always available and will take this weight of your shoulders! 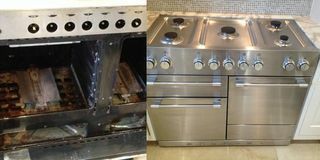 Since Prolux Oven Cleaning Battersea is a local company, we take pride in each and every oven we clean! Our trustworthy and polite technicians will not hesitate even if the stove is fully covered with grease! Cleaning ovens is a hard and specific job to do, that’s why we’ve developed a sophisticated training and educating method. Only people with high level in customer service are selected for our teams. Also, the prices that we work with will not hurt you wallet at all – especially if you combine the oven with the kitchen hood or your grill! We treat each of our clients independently – we come at the most suitable time for you – be it at the weekend or on any holiday! The most important thing for Prolux Oven Cleaning Battersea is our clients’ satisfaction! This is why we can guarantee only one thing – you will never want to clean your stove by yourself anymore! You will just call Prolux Oven Cleaning Battersea your local partner for life! The kitchen is among the most important rooms in the house when it comes to the health of you and your family. It is where the foodstuffs are stored and cooked in, so any dust or unhygienic conditions will cause the worst health issues. So the kitchen is the area to concentrate on when you do purifying the flat. As a rule, the cook-room has a lot of household appliances and areas which can be difficult or waste of time to clean, if you don’t have access to professional-grade cleaning tools. Luckily, at Prolux Oven Cleaning - Battersea, we’ve got a full spectrum of most efficient tools and detergents, and what’s more, our people are highly experiencedin cleaning. All this means you will secure an efficient cleaning that will refresh your kitchen to the very best hygienic norm, because of the fact that our team’s experience and expertise will give your kitchen to the state of cleanliness that yourself and your family deserve. There is no need to spend your free time time scrubbing away inside the oven, or even sweating away with cleaning the blackened ash out of a barbecue, our trained staff will handle all of the hard work. Isn't cooking in a clean oven a pleasure? Absolutelly, it is! But who really likes cleaning the oven at home? It is going to be tough to get volunteers from the household. And, it's simply one of those things we just leave aside for another time that never arrives. To further aggravate the matters is the expectation of having to to inhale the unpleasant and often poisonous products used. And our oven never really gets to look as clean and shiny as the one on the picture. Hiring expert oven cleaning in Battersea is the perfect way to eliminate all unwelcome grime that is built up inside your cooker. Our professional oven cleaners are fully instructed how to use the newest equipment and methods to secure outstanding results for you. Our entire staff is fully insured so you can sit back and relax while we do all the hard work for you. We make every effort at all times to provide complete customer satisfaction and that the requirements of our customers are met. Our thoroughly taught technicians recommend regular cleaning of your oven at least once every 6 months in order to maintain your appliance in perfect working condition. Trust us to do the chore you have been putting off for some time. Our cleaning maid will be finished before you know it. We are highly skilled cleaners and our work is a quality work. We, at Prolux Oven Cleaners are proud of our reputation for supreme cleaning results and complete customer service and satisfaction. The entire work may take from 1-3 hours to clean your oven, cooking range top and kitchen exhaust fan. Your oven will fully free of grease, fat and set-on carbon deposits after the cleaning is done. At the beginning, our technician will dip all removable parts into in a special de-carbonating tank for deep clean. He/she is going to check the work and will leave your kitchen in its prior condition. We, Prolux Oven Cleaning are located in Battersea and service Wandsworth and the immediate suburbs. We use the best and the most efficient cleaning products available. These cleansing agents are completely harmless for your home and your household. They are non-toxic, non-caustic, fume and odor free. We. Prolux Oven Cleaning, are proud of our reputation as the most popular oven cleaning company in Battersea. Furthermore - just take a quick glance at our price calculator and see for yourself our fantastic prices!. Even better, we offer substantial savings when you book multiple cleaning services with us for one visit. Our prices are competitive and affordable. We never stop working - our people are available to work around your schedule. Our staff is proficiently trained, open and courteous.